2008 was a landmark year for the post-9/11 generation. 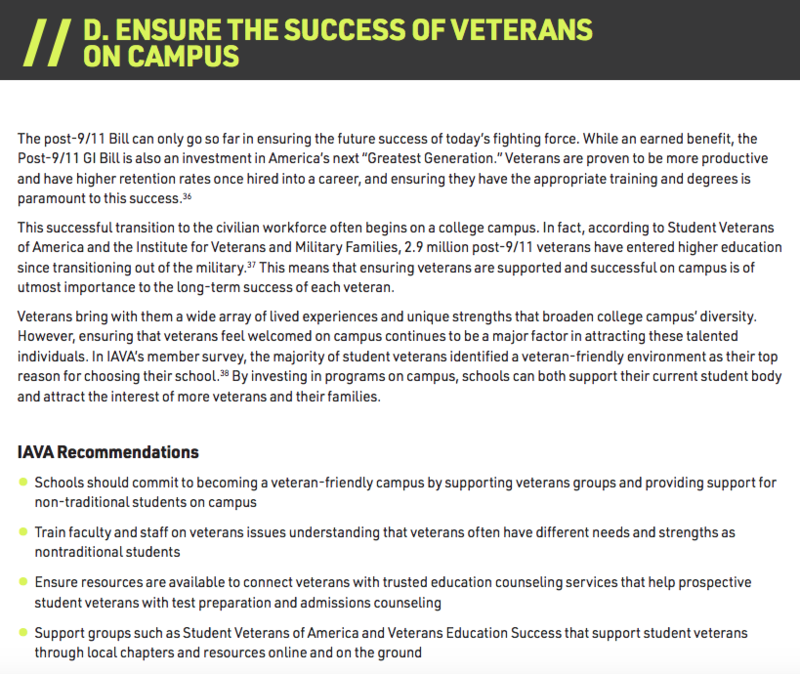 After years of tireless advocacy by IAVA and others, the Post-9/11 GI Bill was passed into law. With it, thousands and now millions of veterans and their dependents had the doors to higher education opened for them. After deploying for years to the battlefields of Iraq, Afghanistan, and other areas, Congress and the American people agreed that these warriors had earned the right to a degree. The Post-9/11 GI Bill has now sent more than one million veterans and dependents to school, and remains one of the military’s best retention and recruiting tools. 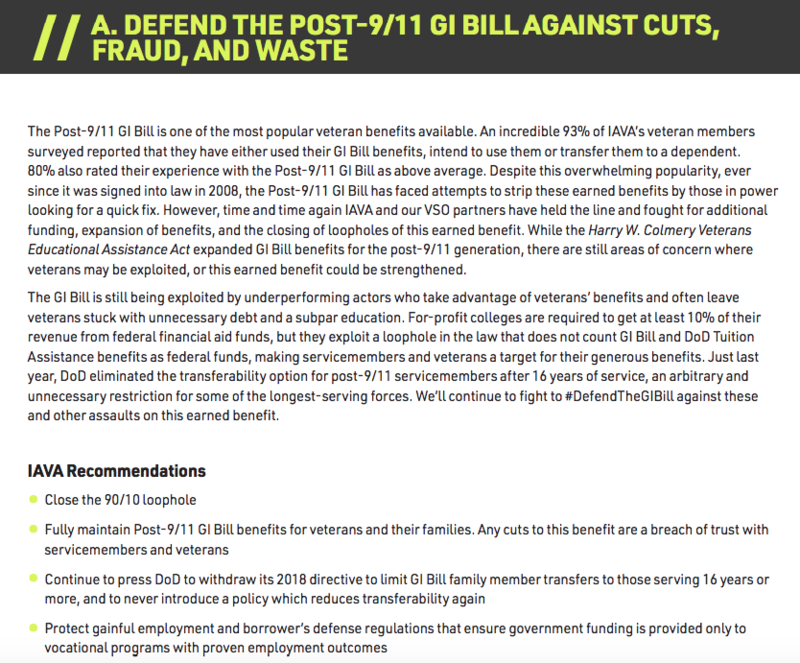 In IAVA’s latest member survey, 93% of IAVA members reported having used, or that they are currently using or planning to transfer their Post-9/11 GI Bill benefit. 78% agree that the Post-9/11 GI Bill is essential to military recruitment and 87% believe it is extremely or very important to transition to civilian life. 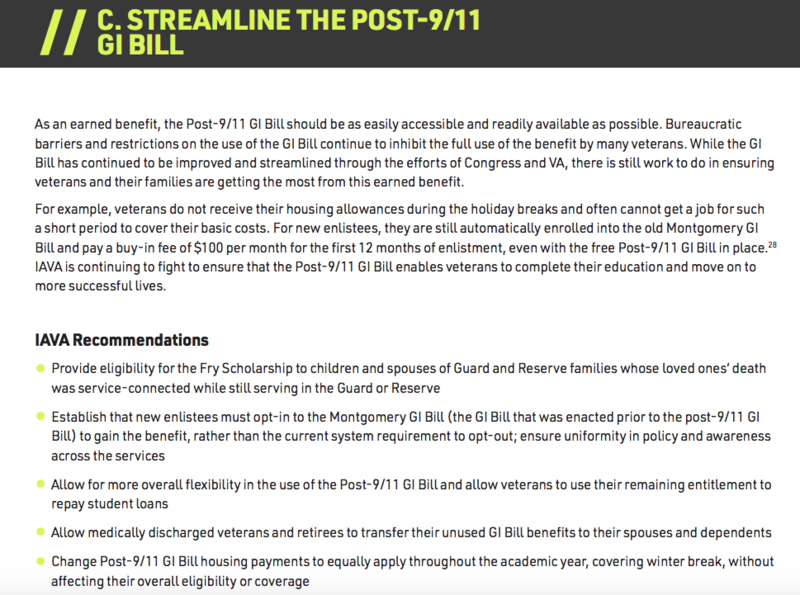 Since its inception, the Post-9/11 GI Bill has also faced threats of funding cuts and abuse. IAVA has been and will remain at the forefront of the efforts to ensure that these attempts are not successful. We must continue to not only hold the line in defending these essential, earned benefits but also in providing that they stay relevant to the changing educational landscape. 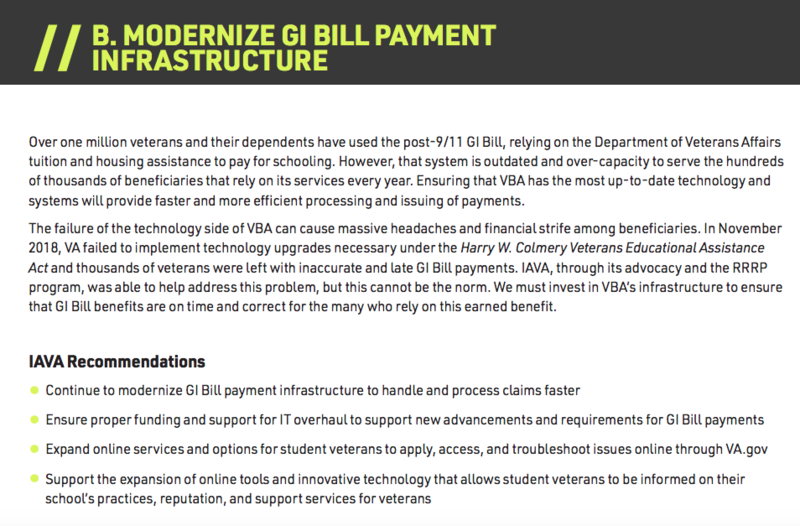 In 2017, IAVA worked with VSO partners to pass the Harry W. Colmery Veterans Educational Assistance Act, which included numerous expansions for the GI Bill, including elimination of the 15-year time limit to use the benefit and IAVA continues to spearhead the fight to close the 90/10 loophole that allows for-profit colleges to be propped up at the expense of veterans. Sign IAVA’s petition to Secretary Mattis in order to remove new harmful DoD restrictions on the GI Bill here.